In my very first post, almost 2 months ago, I shared with you one of my favorite things. Be sure to check it out here if you missed it! 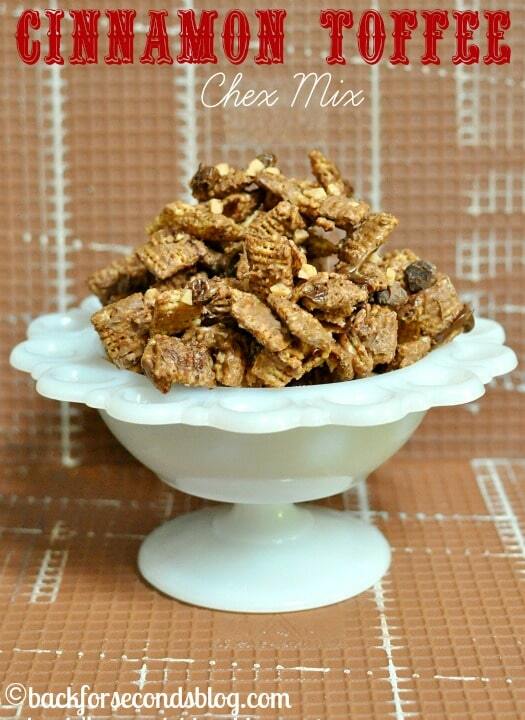 I am always creating new flavor combinations of dessert chex mixes. I just love the stuff. They are quick, easy, and you the possibilities are endless! A few days ago I was in the mood for a sweet chex mix but I wanted to do something different. BAM! It hit me. Cinnamon, chocolate and toffee! It’s a beautiful thing, my friends. Whip up a batch today – you won’t be sorry! In a large bowl heat white chocolate in the microwave for 30 seconds. Stir and continue to heat at 15 second intervals until melted and smooth. Stir in the cinnamon. 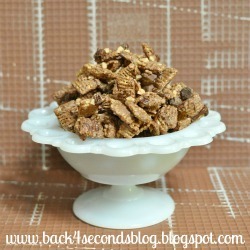 Add chex and toffee bits and carefully stir until coated. Stir in chips and pour onto wax paper in a single layer to cool. After 20 minutes or until set, break apart and store in a tightly sealed container. I made this last night and it is DELICIOUS and addicting!